A Theme Park is filled with excitement with entertainment attractions, breathtaking rides and the amusing thrills that make you wish for your next visit. Theme Park: Tickets of Fortune™video slot game aims at recreating such an experience for you. Just like its name suggests ‘Theme Park: Tickets of Fortune’, the video slot game is packed with some amazing features for you to make the best use of it so as to fulfill your wish of hitting it rich. Netent is a casino game developer in the business of developing innovation video slot games that casino game lovers relish playing every bit of it. Theme Park: Tickets of Fortune™is a five reels video slot game. The game allows you to change the Coin Value and Bet Level to your desired value. Further, you can bet at the maximum level, using the ‘Max Bet’ button. The ‘Auto Play’ button enables you to select your desired number of spins and hence will automatically spin the reels for you. When the Bonus Symbol appears on a reel, it will trigger a bonus wheel game. This will keep you very excited as depending on where the wheel stops, amazing prizes will be for your taking or a new game will be triggered. Another symbol to look out for is the Wild Symbol. This Symbol is in the form of merry customers in a roller coaster. It is a stacked symbol covering an entire reel and will substitute for basic symbols to make a winning combination. The Scatter Symbol in Theme Park: Tickets of Fortune™ video slot game is a set of Three Golden Tickets. All it takes is three Scatter Symbols to trigger the Ticket Wheel game. Once this happens, a wheel will spin and will stop on one ticket. Keep your fingers crossed and hope that it stops at the ticket having the highest value. You can spend your tickets on the bonus game. For instance, to play the Duck Shoot bonus game. You will need a ticket having the value ten. 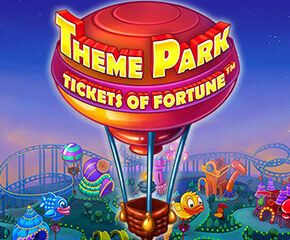 Theme Park: Tickets of Fortune™ is a fun and exciting video slot game to play. It makes you feel as if you are in a theme park enjoying all amusing thrills that come with it. 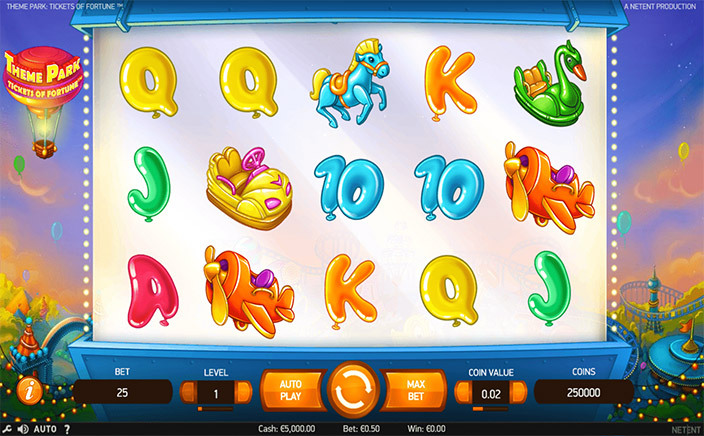 In addition to such a feeling, it has some amazing features like the Ticket Wheel game and the various Bonus Games that will enable you to fulfill your dream of earning some quick bucks.